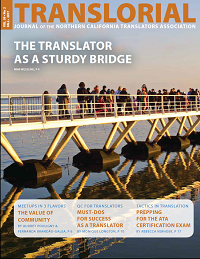 NCTA members can now enjoy  the latest edition of the Translorial in print and downloadable PDF versions, covering a variety of topics. A wake-up call to translators arrived with the May issue of The Economist, a magazine respected for its coverage of international, economic, and technological issues. One of the lead articles announced the bad news that many translators can verify through recent experience: relentless price pressure pushing our incomes downward. The alleged driving force is machine translation, especially as deep neural networks have improved the accuracy of CAT results. Overview and detailed methodology of 7 must-do quality control steps for success as a translator. Meetups in 3 flavors: language, professionalism, fun together. Qismat Amin relates his life as an Afghan interpreter, and later as a translator of intelligence reports for the US. An inquisitive crowd gathered at Golden Gate University in San Francisco on April 29, 2017 to become familiar with the American Translators Association certification exam. The attending members of the Northern California Translators Association (NCTA) welcomed Sean Dodd as workshop coach. Joe’s presentation focused on his work translating the Italian libretto of La Circe, an opera with music composed (presumably) by Pietro Andrea Ziani in 1665 to a libretto by Cristoforo Ivanovich and premiered that year in Venice. Challenges of a necessary skill. What does a conference interpreter do? As Mr. Flerov puts it, s/he will “solve a text.” Faced with a stream of language emanating from a speaker, the interpreter will, “like a snake charmer”, render and evoke the meaning, almost in real time, to an audience hooked to their earpieces. Margarita Bekker demystified not only sight translation in the healthcare setting, but healthcare interpreting as a whole.